Source: ARTBA analysis of federal Census Bureau data for value of construction work in October 2011-2014, adjusted with the ARTBA Price Index to account for changes in material costs, wages and inflation. The real value of pavement work was $5.2 billion in October 2014, down slightly from $5.4 billion in October 2013, when adjusted for material prices, wages and inflation. Despite the slight decline, highway contractors have been slightly busier in 2014, with the total value of work reaching $41 billion compared to $39.4 billion during the same time period in 2013. Although the market is still below pre-recession levels, the 2014 uptick in work is welcome after five years of decline. 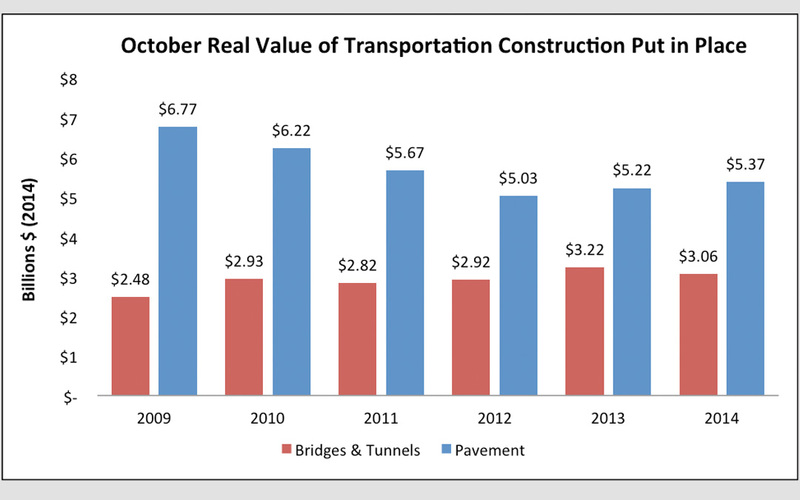 The real value of bridge work was fairly flat at $3.1 billion in October 2014, compared to $3.2 billion in October 2013. Contractors have completed $25.8 billion in bridge work between January and October 2014, compared to $26.0 billion for the same period in 2013. ARTBA expects that the continued challenges facing state and local government budgets and the uncertainty over the federal surface transportation program will temper market growth through the rest of the year and into 2015. Detailed data by month and mode is available as part of ARTBA’s market subscription reports. For more information, contact Lital Shair at lshair@artba.org. You can also purchase ARTBA’s national five-year modal forecast in the online store.